Middle East Eye reporter Noor Harazeen visited a family whose home was hit by a missile from an F16 fighter jet. 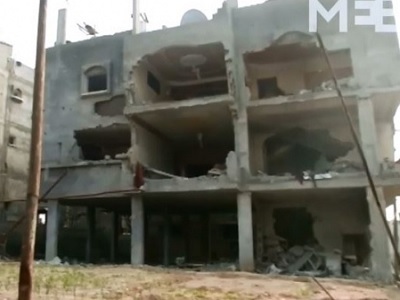 The missile crashed through the roof and penetrated the ground floor without exploding during the Israeli assault last summer. The government doesn’t have the expertise needed to remove the missile and now the family is forced to live with it, although they know that the missile could explode at any time. In the densely-populated coastal enclave, with a population of 1.8 million, civilians – men, women and children paid a terrible price during the Israeli assault. The deadly 50-day July-August war killed nearly 2,200 Palestinians and wounded more than 10,000. Six months after the attacks, the residents, and entire families like this one, remain at risk.